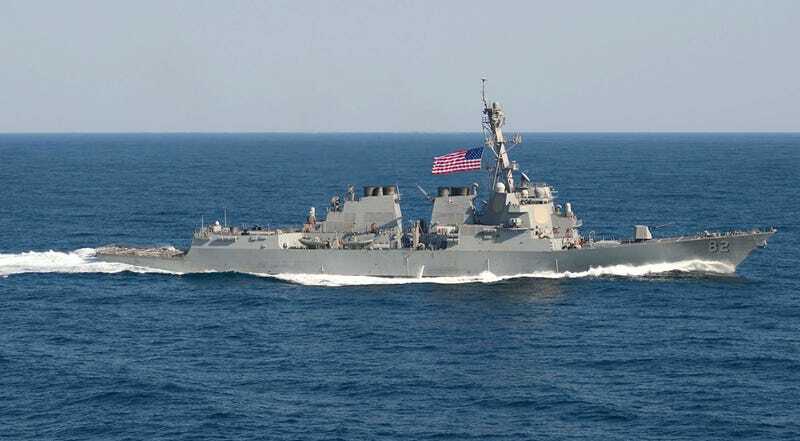 Within the next 24 hours, the U.S. Navy will execute a freedom of navigation mission in the South China Sea that will put the Arleigh Burke Class Destroyer USS Lassen within 12 miles of China’s man-made islands. Air cover and reconnaissance aircraft will be monitoring the mission nearby in international airspace and waiting to give assistance if need be. The Navy has been ready to make the mission happen for some time, the final step being getting an approval from the Obama Administration, which has now happened. There was some indicators that Washington may be reconsidering moving forward with the mission due to what seemed like a fast flurry of military-to-military good will over the last month between the Pentagon and the China’s National Ministry of Defense. Now it appears that this could not outweigh the need to make a precedent to China when it comes to their territorial ambitions in the South China Sea. China’s man-made islands, dredged up from coral reefs and atolls, are not recognized by the U.S. and neighboring claimants on different areas of the South China Sea. These include the Philippines, Malaysia, Taiwan, Vietnam and Brunei. Even if they did recognize these new islands as legitimate territory, sailing within 12 miles of a country’s shores is fair under the rule of safe passage. China exercised this rule on the U.S. by sailing through the Aleutian Islands with a naval flotilla while President Obama was visiting Alaska this Summer. China has been extremely sensitive about U.S. aircraft even flying near their South China Sea island projects, nonetheless having a U.S. Navy ship sail within their 12 mile boundary. China has also been extremely heavy handed with neighboring countries fishing vessels operating in the area. With this in mind, it is unknown how China will react to this territorial challenge by the U.S. Navy. The South China Sea is not only one of the world’s key trade routes, but it is also a prime fishing area and is thought to be rich in untapped energy resources. If China were to arm its islands with missiles, ships and aircraft, it could shut down access to nearly the entire region on a whim. We will keep you updated as the story unfolds.